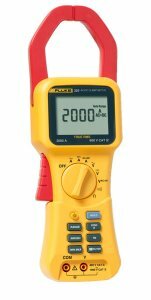 Fluke Introduces a new line of Clamp meters which promise to surpass expectations, meaning the user can confidently take reliable readings with the true-rms. The Fluke 355/353 Clamp Meters; the tools of choice for high-current measurements up to 2000 A. The Fluke 355 is designed with extra-wide jaw easily to clamp around large conductors typically found in high-current applications. The rugged design and CAT IV 600 V, CAT III 1000 V ratings, add an extra element of protection when taking high-powered measurements. Accurate peak measurements can be taken using the in-rush current mode, ideal for motors and inductive loads. 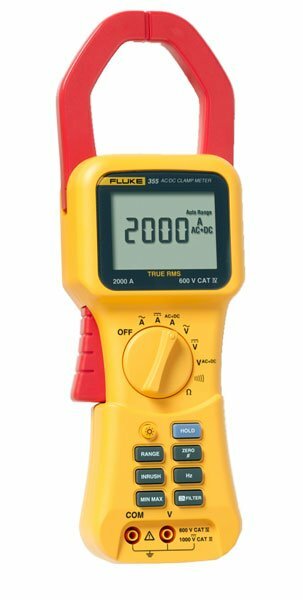 The Fluke 355's Sister Clamp meter, the Fluke 353, lacks the ability to measure voltage and resistance, however this makes it more affordable for those people who require a high quality product and do not require excess options. The functions of these two clamp meters easily makes the Fluke 353 and 355 the most versatile tool for utilities, electrical contractors, and industrial service technicians. Safety Rating: IEC 61010-2-032, 600 V CAT IV.